The big game calls for big appetizers. I’m excited to be working with The Coca-Cola Company again to share not one, but TWO bold, flavorful recipes that will make a winning football party! Earlier this week I shared my Coca-Cola Home Bowl Party Table with the most adorable Cherry Coke Chocolate Float Cupcakes. 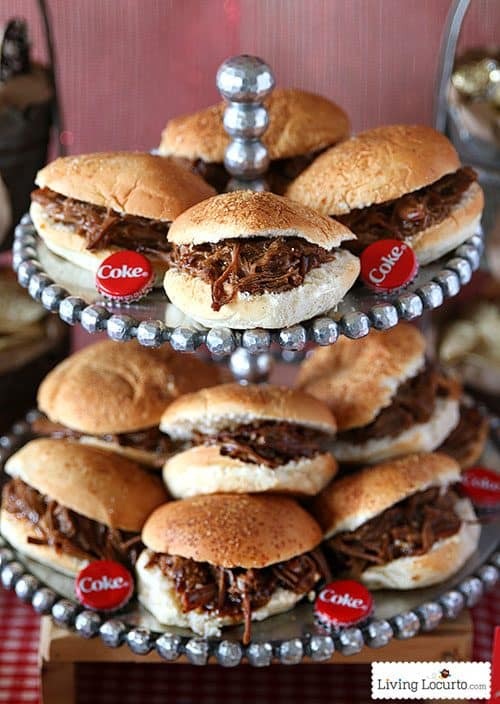 These Slow-Cooker Coca-Cola Beef Brisket Sliders and Candied Jalapeño Pimento Cheese Bites are the perfect savory recipe additions to the food line up! 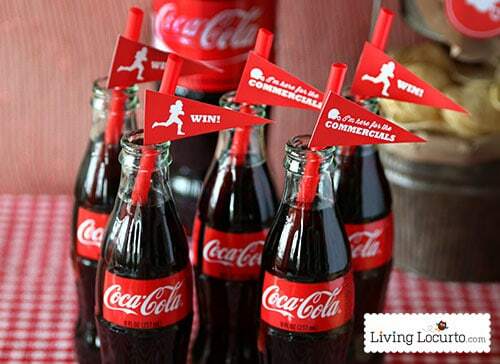 Coca-Cola and Ritz have teamed up for the Home Bowl where you can create a custom Home Bowl Evite invitation and find more game day tips. Get great coupons by registering for MyCokeRewards. You also get a chance to win a prize pack worth $350!! There will be THREE LUCKY WINNERS, so scroll down to get all of the details and enter to win! Get the Football Party Appetizer Recipes and Enter the Sweepstakes (value $350) below. Good luck!! 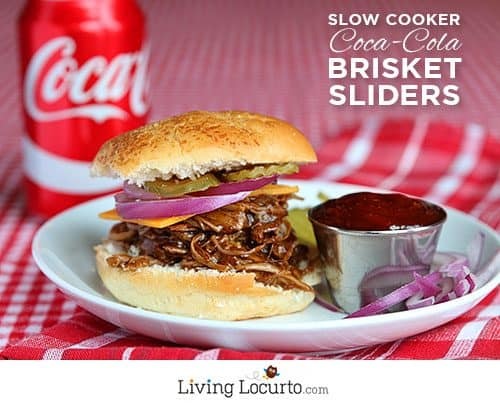 Add Coke, barbecue sauce and hot sauce to your slow cooker and stir. Remove as much fat from the brisket as you can and sprinkle the meat with salt, pepper, and garlic powder. Add this to your slow cooker. Cover and cook on low for about 8 hours. Or high for 6 hours. 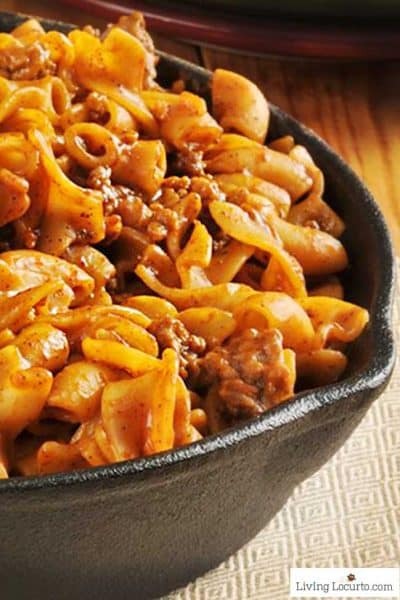 Once it is cooked, remove the meat from the pot and let it rest. Then add more barbecue sauce to the juices in the pot to thicken it up. Put your meat back in and shred it with forks. Serve it with anything you like. We like extra sauce on the bun, onions, cheese, and pickles! Mix the cheeses together then add the rest of the ingredients. Add salt if needed. 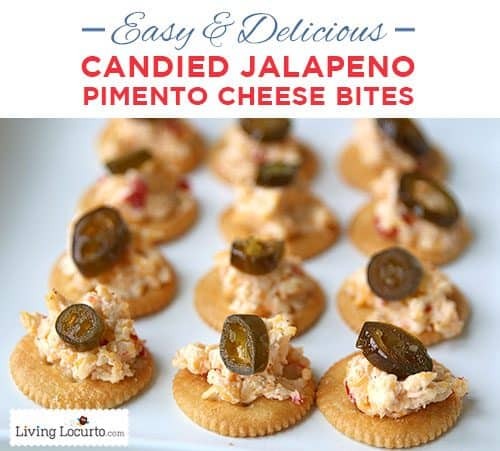 Serve on Ritz crackers with a candied jalapeño on top. 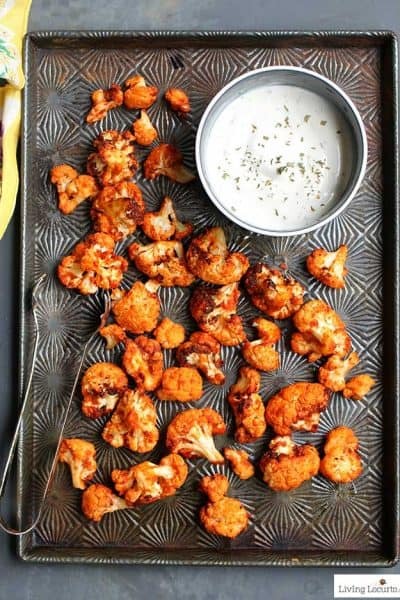 These are some of THE BEST appetizers you will ever taste and easiest too! 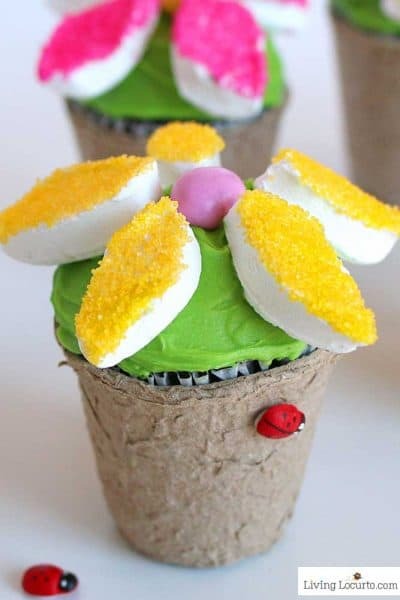 All you need to do is pin your favorite game day party tips and tricks on Pinterest! 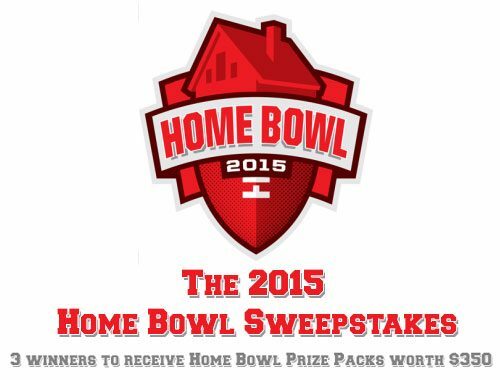 You must include the hashtag #HomeBowlHeroContest in your pin description. 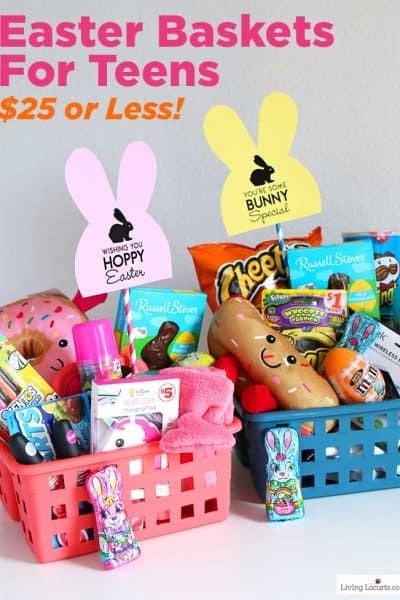 Click Here to Enter to Win the $350 Prize Pack! ** The Sweepstakes Entry Period begins now and closes February 2, 2015. 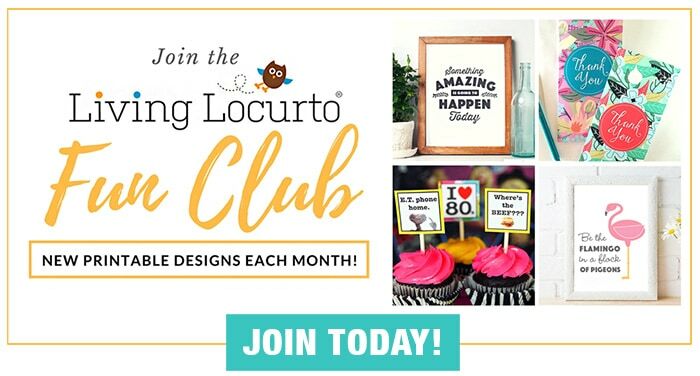 You do not need to pin photos of Coca-Cola or Ritz to be entered to win. Download the Free Football Party Printables here. 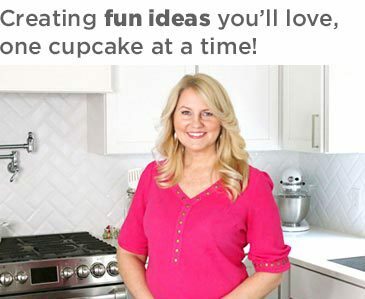 Thanks for the yummy recipes and the chance to win the Coca-Cola Home bowl Sweepstakes! 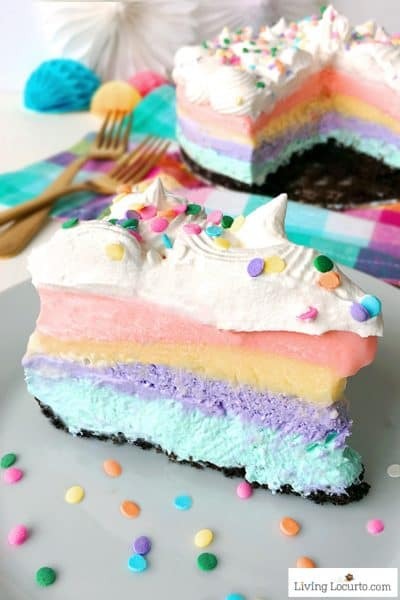 I can’t wait to make that. Yummy!! Both of these recipes sound amazing. 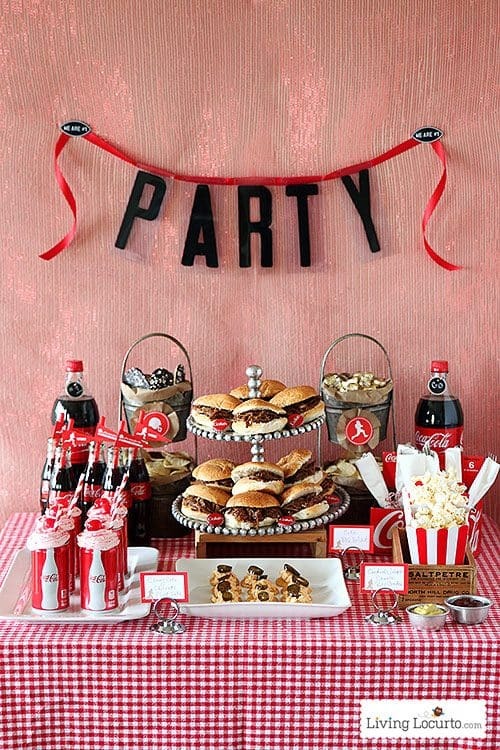 I love your Coke party table–so cute! Pinned. Oh my gosh that slider. NEEDED!